The generous people at the CSN stores have given me a great opportunity to give back to all of you, by offering a $45 gift card giveaway!!! Yay!!! If you are not familiar with the CSN online stores they have everything you could ever possibly need and more, like these beautiful dutch ovens. I have purchased many a kitchen gadget from them, and have lots of other wish list items to go. They are fabulous! You can peruse their entire selection from all of their stores here, and I encourage you to do so. To enter the giveaway simply leave a comment on this post telling me your favorite fall inspired recipe (a brief description will suffice). 4. And, last but not least (in a transparent and shameless act of bribery) you can vote for Jacob’s Kitchen in Project Food Blog challenge 2 by clicking here. Please leave one additional comment for each additional entry, telling me which you have done. Unfortunately, only US and Canadian readers are eligible to win. (For the rest of you, check back soon for more giveaways!) Comments can be received up until 11:59pm on Tuesday, October 5, 2010. One winner will be randomly selected and announced on Wednesday, October 6, 2010. In the meantime, I thought I would take this opportunity to share with you one of my most requested recipes, which I call Jacob’s Signature Salad. In order to give credit where credit is due, this salad was actually first invented by the culinary genius Kristi Chauvin Baker, a deeply fabulous friend from college. I have, of course, put my own little spin on it over the years, replacing the toasted walnuts in her recipe with glazed walnuts, and by re-imagining the dressing. The salad itself is very simple, but packed with the great flavor. Baby greens are topped with sliced fuji apples, dried cranberries, glazed walnuts, and crumbled blue cheese, and then drizzled with a tangy balsamic blue cheese dressing. People really go crazy for this salad, and it’s not difficult to understand why. The combination of flavors and textures make it feel really special. As a first course, side dish or light lunch this salad is always a big hit. It is elegant in its simplicity, and since everything can be prepared in advance and dressed right before serving, it is perfect for entertaining. (Simply toss the sliced apples in freshly squeezed orange or lemon juice to prevent them from turning brown.) Enjoy! I’d say my favorite fall-inspired meal would be ravioli with either butternut squash or pumpkin filling with brown butter. So simple and so good! I subscribe to your blog in my Google Friend Connect. My favorite fall-inspired recipe is Pumpkin Oats– Scottish oats with cottage cheese and pumpkin stirred in just before they’re done and topped with pumpkin flax granola and some dried cranberries. Delicious! Also… I just started following you on Twitter! Fall inspires me to bake. I made a lovely apple crisp. So simple. I made home made ice cream to go with it, of course. Also delightfully simple. I added some butterscotch chips to it last time and I’m going to count that out in the future. I’ll try something else instead. Maybe a little caramel? The ice cream is so simple. Two cups heavy cream, a cup of milk, 3/4 cup of sugar and some vanilla. I really enjoy fall for cakes and cupcakes and especially cookies. Oh, and chili and enchiladas and pretty much anything else which heats us up. My favorite dish is acorn squash roasted and stuffed with a ground meat mixed with onion, peppers, and pumpkin along with spices and maple syrup. Friended you on Fb and tried to do facebok but facebook is messed up right now and will not allow me to add anyone but I think I can still tweet. I voted for you to advance! I have requested to be your friend on Facebook! I am a follower! I love your posts, and your pictures are amazing! I want to make it all! Love that salad. Following you on Twitter now. And as for my favorite fall-inspired recipe, it would be the pumpkin chocolate chip muffins I love to bake between Oct. & April! I just made a cheddar corn chowder last week, and it is definitely my favorite fall eating. Just sauteed onions and celery, bacon, whole milk, potatoes, sharp cheddar and sweet corn, seasoned with pepper, celery salt, and a generous helping of curry spices. It’s even better when you puree some of it (but not all!) My mom used to serve it with oyster crackers which she had tossed with melted butter and other seasonings. You can also leave out the corn and cheese and throw in seafood or chicken for a carnivorous feast! …and I follow you via e-mail as well. …and I would take a bullet for your pecan bars. I voted for you yesterday! My favorite fall recipe is Roasted Butternut Squash with toasted walnuts, sage, and feta over Linguine. I voted for you earlier! My favorite fall recipe is Roasted Butternut Squash with toasted walnuts, sage, and feta over Linguine. I can’t wait to try some of your recipes. The salad looks amazing. Thanks for the recipes. Fall inspired huh… I’m gonna say just about anything with pumpkins or apples. I love them both and enjoy having them so much all year round. And nothing beats a FANTASTIC tasty, moist turkey! Squash is definitely a fall staple in my kitchen. Love the salad dressing you made for this salad! I really shouldn’t look at your website when I’m hungry. Every year I look forward to pumpkin bread. Who am I kidding? It’s really pumpkin cake! I love it but only make it in the Fall as that just seems like the right time to do it. Making pumpkin cake in Spring doesn’t work. I enjoy seasonal eating and having yummy things for which to look forward. I suppose it counts as fall inspired, seeing as how college football season and the fall inspire me to make a huge pot of chili for gamedays! I just voted for you (which I needed to do anyway!)! My favorite fall-inspired recipe is homeade apple pie. Love the salad post above – I make a similar one and change up the dressing with a white wine vinegar based dressing in the summer, and a reduced balsamic glaze/marinade in the fall/winter. 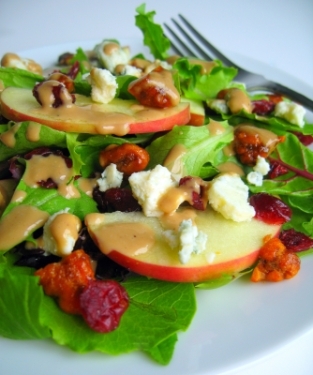 LOVE apple in salads! This one looks great. My favorite fall inspired food…simple but oh so tasty, butternut squash soup! My favorite fall recipe is definitely pumpkin pie! I voted for your PFB challenge. Great work! My favorite fall-inspired recipe would have to be pumpkin pie – it’s so simple but I love it! Voted for your PFB challenge – good luck! I have so many fall favorites it’s hard to pick one! But I guess if I have to it would be my gingery buttercup squash soup! P.S. I voted for you! Favorite Fall dish… cooked by someone else – pumpkin pie. Cooked by me… pear crisp with oatmeal streusel, roasted root vegetables and roasted turkey. I friend you on fb as Dee G. Thanks! I subscribe via email to your blog. When I think fall, I think squashes, and I think butternut squash soup. This looks great. It’s so hot on the west coast, we’re still in need of these cold salad dishes!!! 1) That salad looks fantastic! 2) My favorite fall dish is pretty much anything with apples–they’re so perfect in the fall! Beautiful salad looks so colorful and yummy. my favorite fall inspired recipe – mini pecan cheesecake pies. delicious!! This is my favorite kind of salad. 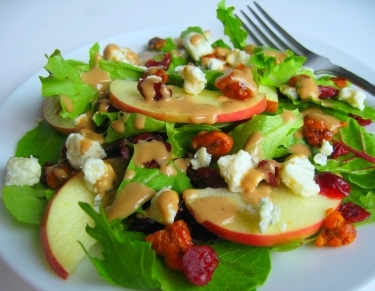 The apples, walnuts and blue cheese on the baby greens are such a great combo. The dressing sounds amazing! I’ve added you to my RSS. And now want to make that salad! My signature fall dish is a 4-cheese pumpkin lasagna that I make once a year only in the fall. However, the last couple weeks I’ve been in pear baking overload. A colleague loaded me down with pears from her trees, so I’ve baked praline-pear bread, almond pear bread, creamy pear pie, and pear bars. Who knew there were so many pear recipes out there? I also subscribe to Jacob’s Kitchen via email. Ahhh I love cooking up some spiced pumpkin pancakes come fall!! Adding pumpkin puree, pumpkin spice, and cinnamon to the batter fills the whole house with good smells! My favorite food of all time (but it’s very appropriate in the fall) is pumpkin cookies. Specifically, the ones the Amish make. But since I can only get those every once in a while (since I don’t live near any Amish markets), I made my own last year and they actually came out pretty good! I plan to make them again soon. Homemade ravioli stuffed with goat cheese and pumpkin. Yum! Also, I just added you on my Twitter follow list. My favorite fall inspired recipe is pumpkin cheesecake! My favorite fall inspired recipe is an apple pie. My favorite fall recipe is Baked Apples with Granola. I love anything with winter squash, but pumpkin custard is always a favorite. Yum! My favorite? Hot spiced cider with real whipped cream. Delicious. I voted for you in Project Food Blog! My favorite fall recipe is pumpkin chocolate chip cookies – so good. i’m your fb friend too! for fall eating i like beets – in any way i can get them. Your salad looks delicious! I wish I could find a suitable replacement for blue cheese rather than just leaving it out of recipes, because try as I might, I just can’t learn to enjoy it. C’est la vie, I suppose. The Waspy Redhead posted a chocolate chip pumpkin bread recipe last week that I’ve made into muffins twice since then, so for the moment, that’s absolutely my favorite fall inspired recipe! I love making roasted butternut squash soup! yum! I’m looking to classic pumpkin pie! I am also giving away a CNS gift certificate! Voted for you on PFB! Shake and strain into a martini/coupe glass. A good deal of honey will remain in the shaker — it should. Haven’t thought of a garnish yet, but a grilled piece of pineapple would be nice. When the weather starts getting cooler in the fall, I start thinking about soup and chili. I also start making pumpkin breads, pies, and muffins. It’s hard to pick a favorite, but I think I’ll go with white bean soup. The recipe calls for beans, cumin, onions, chicken, celery, chicken broth, spices, and green chili’s. I was happy to vote for you! I now follow you on Twitter (TTRigell). Thanks! My favorite fall inspired recipe so far this season are pumpkin pancakes! I have voted for you! Thanks for the salad recipe! This is a beautiful salad with autumn ingredients. The dressing sounds delicious. My favorite fall inspired recipie is a homade soup with fresh peas, beans and potatos straight out of the garden. I did everything. You can’t hide from me now 😉 Wishing you great success as you continue through the PFB challenges. I wish I were joining you, but now I can sit back and enjoy all the great food without doing all the hard work! Cheers to you, my newfound foodie friend (and, thanks for all you do!). sad I didn’t make it through but so HAPPY you did! you are my front runner…I know you will not disappoint! good luck….you will go far in this competition! My favorite fall inspired recipe is Autumn Chowder. It’s a mix of bacon, potatoes, carrots, celery, onion, milk, cheddar cheese, and seasonings! Mmmm it’s super good! I like making Pumpkin Soup. Its a simple recipe using pureed pumpkin, broth, cream, and a few other ingredients. You can add Tabasco for a little kick or add pie spices for a different taste. Im an RSS feed subscriber (My Yahoo) and the salad looks DELICIOUS! Halloween cookies! Especially our pumpkin-spice cookies with royal icing – they are a must during this season! I think that apples and all of the dishes (apple crumble, pie, and homemade applesauce) really make me think of fall. Howver the numberone dish that screams autumn to me is Pumpkin Pie. I also love to start making potato soup this time of the year. Oh this salad looks delightful. your recipes are always so simple but still so beautiful. My favorite fall inspired recipe is my mothers favorite pumpkin pie recipe. we have been making it for years and it is always a big hit. Nothing says fall quite as much as a nice big slice! I am already friends with you on facebook ! My favorite is roasted turkey and stuffing! I look forward to it every year! Favorite recipe is an old but goodie, sweet-sweet potatoes. Lots of butter and sugar, and an indulgence that I get once a year when my amazing sister in law cooks it for Thanksgiving. My fav recipe for the fall is candied yams. My mom would slice the yams real thin then she would layer them sprinkling her sugar concoction that had all those yummy fall spices in it. It is then baked in the oven just this side of candy. So good! I love making Roasted Pear and Butternut Squash soup. Perfect for fall! My favourite fall recipe is my aunt’s thanksgiving bun recipe. They’re so hearty and warm and perfect for all types of butters and jams. Delish!! I don’t know that I can choose a favorite fall recipe because I am torn between a variety of pies (can anything beat a warm apple pie or a slice of pumpkin pie with fresh whipped cream) and soups (I am making split pea soup today). I’m also not going to leave several messages, because this is about the comment, not the prize. I’ve voted for you each time because your cooking is outstanding, as is your blog. I was entranced by the meal you made for challenge 3 and thought the salad above was gorgeous. I’m thrilled that you’re going through now and giving us all the recipes. The format you took for the challenge, walking us through the steps for throwing a luxury shindig was unique and well thought out. However, I kept shouting, “Where are the recipes?? ?” Thank you for posting them now! Good luck once Round 4 comes (because I know you’ll make it there).